Prior to learning about Crown Records Management, Surgical Associates in Houston stored their medical charts in multiple public storage units for years. The practice owner experienced challenges with this method: costs with public storage continued to rise, the security of their information was always questionable and they had to re-box their material a number of times due to the storage conditions. 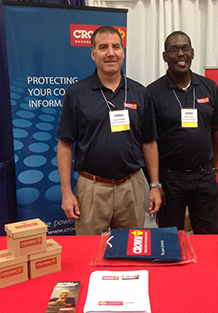 Crown Records Management was introduced to the primary physician of the practice at the Harris County Medical Society 2015 Spring Business Expo where Crown was an exhibitor. The physician quickly saw the benefit of exploring a change in his current system of storing and protecting patient information. He was also concerned about the safety of his employees when they had to run to the storage unit to retrieve information. After talking at the business expo, the doctor asked the Crown representative there to schedule a meeting to show him a different way of protecting his patients’ information. We met with the doctor and practice manager on April 20 and designed a strategy together to remove their material from public storage by the goal date of June 30. Crown Records Management’s proposed solution was a storage program that would allow them to securely store their records away from their office, provide easy access to the information as needed and provide the ability to deliver charts back to them when requested. With the advent of electronic medical records (EMR), the practice manager was enthused to know she could receive her charts back electronically, if needed, and that we could help with the disposal of the records as their retention criteria was met. The outcome for Surgical Associates is exactly what they were looking for. As we cleared out a storage unit on our initial pick-up, the practice manager stated, “I don’t know why we have not done this sooner. This so much easier and will save us a good amount of money every year.” Our secure online customer portal also allows Surgical Associates to access their information and enables them to expedite and coordinate requests when needed. Since the program recently started with the removal of their cartons from the first public storage unit, Surgical Associates will realize an initial savings of close to $1600 a year in storage costs.